There was another Franz Frank Skroch born in 1836. 21 years old. In 1883 he went to Watertown S.D. and worked around that area as a Carpenter. He left Watertown in 1887 when he went into the Red River Valley near Grand Forks, N.Dak. where he worked until 1889 at which time he returned to his home in Wisconsin. In March 1893 he came back to Geneseo, N. Dak. where he lived till 1931. He then lived in Lidgerwood N. Dak., part of his time with his daughter Frances and the rest of the time with his son Ted until his death April 18, 1938. I wish I had gotten to know Grandpa. Hale and hardy at 75, Frank Skroch, resident of this territory since 1893 declared Wednesday "times were better in those days because everything was cheaper". Mr. Skroch passed the three-quarter century mark October 10, at the home of his son, Ted, who operates a filling station here. His family and a few friends helped him observe the anniversary. Born in Upper Seliesa, Polish territory in 1860 Mr. Skroch came to Wisconsin with his parents when he was nearly 22 years old. His father settled a farm near Independence and Frank stayed with him until the winter months when he went into the woods as a lumberjack. In the spring of 1883 he went to Watertown S.D. and worked around that country as a carpenter. In the winter of '84 he was caught in a blizzard on his way back to the farm where he staying. "I walked from the farm to Watertown, 46 miles, to get some stock in the morning." he recalled. "I left after dinner and when I had walked about 16 miles back it started to snow, I couldn't see much but I happened to be near a strawpile which was used to shelter cattle. I had to dig my way through the snow but I got under it. That was 4 p.m. The following day at 3 p.m. I finally crawled out and walked to the nearest farm." 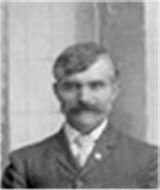 Mr. Skroch stayed around Watertown until 1887 when he went into the Red River Valley, near Grand Forks where he worked until 1889 at which time he returned to his Wisconsin home. March 28, 1893 he came to Geneseo where he stayed until the fall of 1931. In 1893 Lake Tewaukan was dry. It filled in 1897 and did not go dry until 1934, he stated.
" In the winter and spring of '96 and '97 it rained and snowed." he said. "I remember a drift 16 feet high between the depot and the elevator at Geneseo. No trains came over the Great Northern for three months and the Soo came through only once a week. We had no coffee or sugar so we burned barley and sometimes wheat to make our own coffee. Some times we had mash. When the snow thawed I made a boat at my father-in-law's place, John Maczkowicz, and I rowed from his place, a mile and a half to Geneseo. In 1897 he was married and a year later he bought one acre in Geneseo from Joe Woytassek for $10. He built the home which is now occupied by Lee Odenbrett. He is the father of 10 children, three of whom are dead. He has two daughters, Frances and Victoria, and five sons, George, John, Ted, Albert, and Peter. Mrs. Skroch died in 1928. Frank Skroch, 77 years old, veteran carpenter, died Monday morning in the home of a son Theodore Skroch, after an illness of six weeks. Funeral sevices will be held at 9 a.m., Friday in St John's Catholic church with Rev. John Kulczyk officiating. Burial will be in the Catholic Cemetery in Geneseo. The Hankins Funeral home is in charge of arrangements. Pallbearers were Frank Wisnewski, John Kaczynski, Wencel Mokrzewawi, Roch Waldera, Joseph Teusch, Albert Lawerence, and Walter Ressler. Mr. Skroch was born October 10, 1860, in Poland, and came to the United States 58 years ago. He settled in Sargent county and for 45 years was active as a carpenter. He constructed many of the early building in Lidgerwood and was employed in construction of farm homes and barns throughtout this locality. He retired about six years ago and came to Lidgerwood to live with his son. Mrs Skroch died 10 years ago, May 14, 1928. Surviving him are two daughters, Mrs Andrew Woytassek of Lidgerwood and Mrs Ralph Kiefer of Geneseo; five sons, Theodore and Albert of Lidgerwood, George Skroch of Stiles, Peter of Valley City and John Skroch of Des Moines, Ia. Two daughters and one son preceded him in death. Mom said GrandPa was a small gentle man, never had that much to say and was never pushie. Uncle Albert was the most like Grandpa. Uncle John was a lot like Grandpa Maczkowicz. Passed away Monday, May 14. From Fatal Illness: Had Many Relatives Here. Mrs Victoria Skroch, wife of Frank Skroch of Geneseo, passed away on Monday, May 14, at the Wrights Hospital, Fergus Falls, Minnesota, after a long illness. She was born at Iron Ridge, Dodge County, Wisconsin in 1878; moved to Breckenridge at an early age, and then to Geneseo. She was married at Geneseo to Frank Skroch to which union were born ten children, seven of whom are still living. She had been afflicted with a serious illness for some time and had submitted to two operations, but failed to recover from the trouble, and was again taken to the hospital where she passed away. Surviving her are her mother Mrs John Maczkowitz, of Geneseo; Frank Skroch her husband; seven children, Mrs, A.J. Woytassek , George Skroch, Mrs Ralph Kiefer, Albert Skroch, Ted Skroch, John Skroch and Peter Skroch. Sisters are Mrs Joe Gerezek, of Lidgerwood ; Mrs. Chas. Devaull, of Wallace, Idaho; Mrs Martin Mackove, Geneseo; Mrs. Ben Sheppel, of Webster, S. Dak; Mrs Julius Wolffe, of Lidgerwood, Brothers are Anton Maczkowicz, John Maczkowicz, Frank Maczkowicz of Toledo, Ohio. August 10, 1897, Mike's birthday. Witnesses: John Kubache and Clara Maczkowicz. Victoria Maczkowicz. Registered Sargent County NDak. Married: Andrew John Woystassek, 22 Sep 1924 at St. Martin's Church, Geneseo, ND. Married Mary Zell Nielsen on 19 Feb 1955 at St. James Church, Edgemont, SD. POB: Geneseo, Sargent Ct., ND. DOD: 14 Mar 1996, Sargent County Manor Forman, ND.